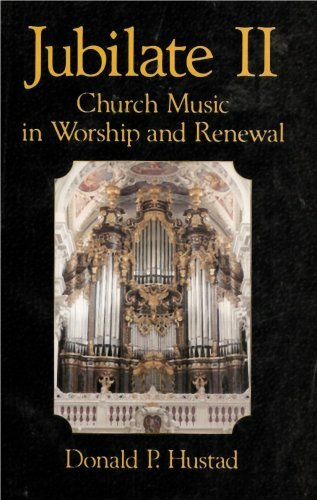 Today we have a Worship Quote within a Worship Quote, a fifth century comment about the power, emotion and truth of church music as presented in Don Hustad's recent Jubilate II. Read on! The use of music as an expression of emotion linked to theological truth is common in all churches. In the evangelical traditions where personal religious experience is emphasized, emotional expression is one of music's most important meanings; it is probably that function which folks refer to when they identify "music that speaks to the heart." But this is not a new experience for churchgoers. St. Augustine mentioned it in the fifth century. "How greatly did I weep in thy hymns and canticles, deeply moved by the voice of thy sweet-speaking Church! The voices flowed into mine ears, and the truth was poured forth into my heart, whence the agitation of my piety overflowed, and my tears ran over, and blessed was I therein." The emotional power of music is perhaps best realized in the life of the church when proper music is well coupled to appropriate text. (Note that Augustine joins emotion with truth!) In this union, the music dramatizes, underlines, "breathes life" into the words, resulting in more meaning than the words themselves could express. St. Augustine (354-430) as quoted in Donald Hustad's Jubilate II: Church Music in Worship and Renewal, Chapter 2, "Church Music: A Functional Art," Hope Publishing Co., 1993.